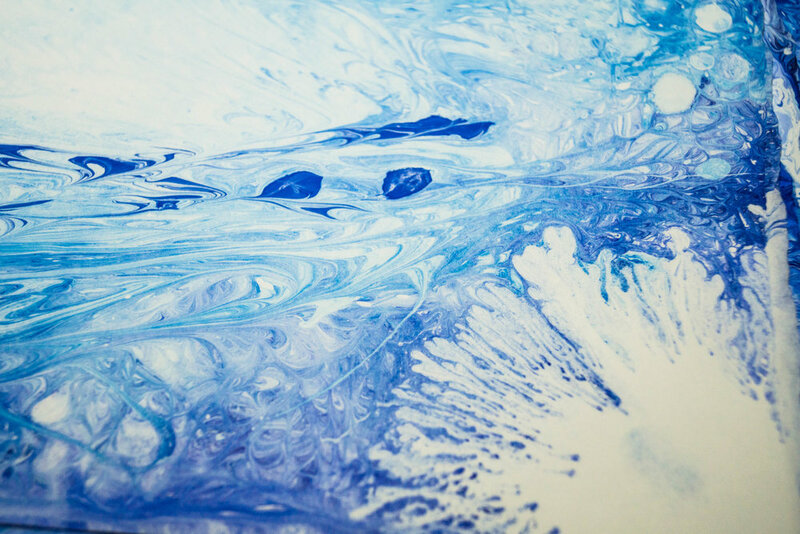 Ebru, also known as marbling, is a traditional turkish art that has evolved and developed over centuries into a multidimensional art. It is performed by placing paint on the surface of a liquid called a size. The size is rather dense so that watered down paints and pigments can be applied to it without sinking. 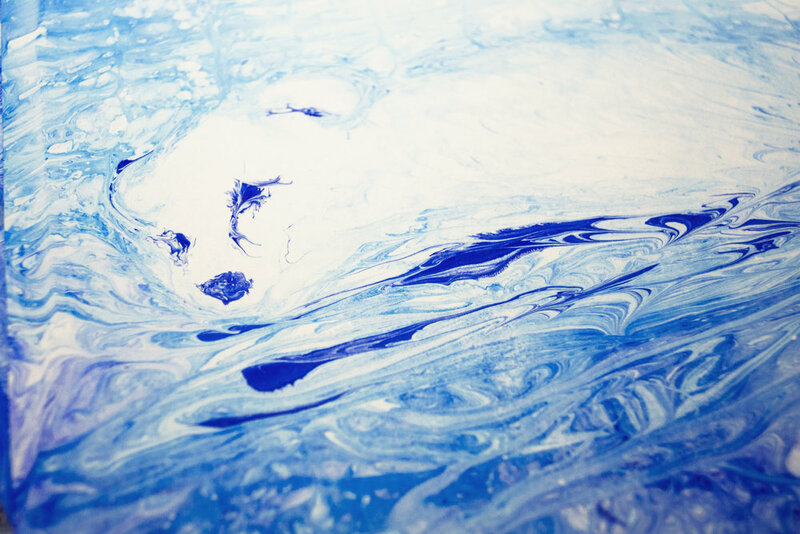 These paints and pigments sit on the surface of a size and, depending on how much water they contain, spread over the surface in different ways. They can then be manipulated with tools like combs or needles. Depending on how they are manipulated they may mix or they may remain clearly differentiated. 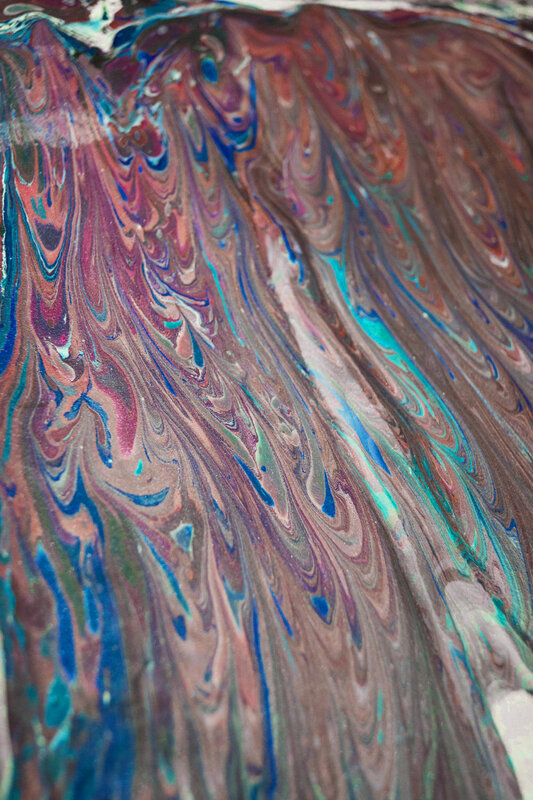 Paper that has been treated with a mordant (to make the pigment stick) is placed over the surface so the paint can adhere. The paper is then rinsed and hung or laid to dry. There are many different strategies in application and manipulation of paint and of paper which lead to different results. In fact you can never exactly repeat or reproduce a result, though you may try or manage to create something similar, because it is such a sensitive process. The products can be large or small, abstract or realistic, complex or simple. 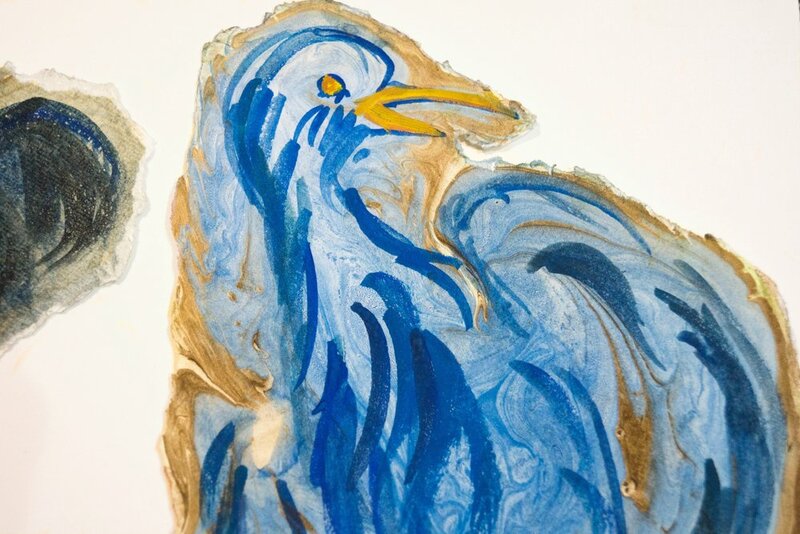 It can be applied to a plethora of materials and make use of different pigments or paints; Ebru artists are constantly innovating in their practices. This past Fall I wanted to expand the reaches of my skill set by experimenting with an entirely new [to me] process. 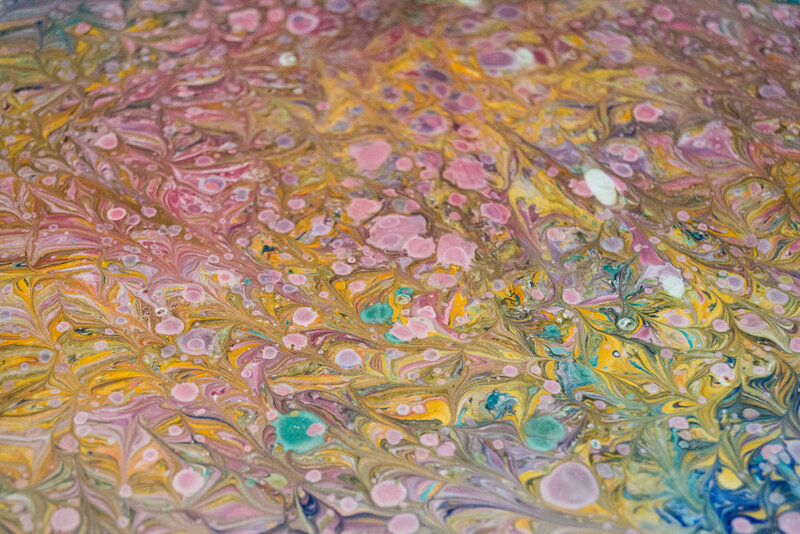 I decided to try marbling because it is performed entirely differently from my usual practice of illustration—on the surface of a liquid. My most comfortable style of drawing uses a lot of hatching and line work. I wanted to challenge myself to draw more fluidly and explore a different creative mindset. After some initial research and practice, I quickly became inspired by the history, the process, and the results of Ebru. 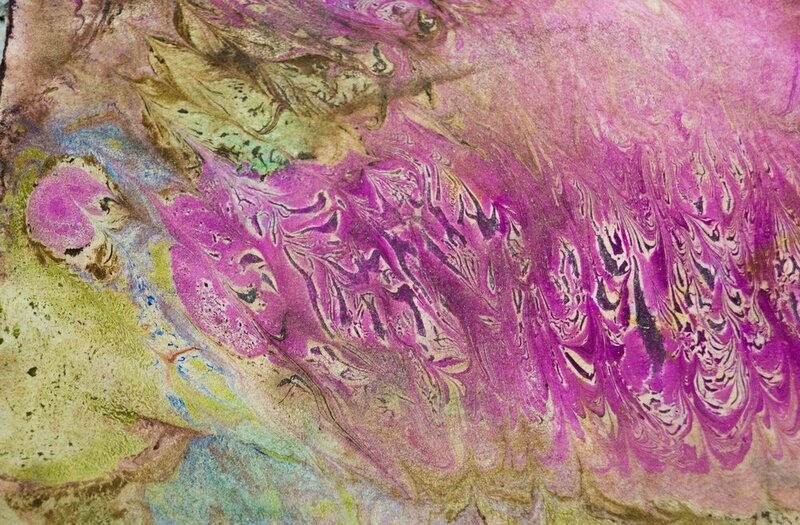 In marbling, all of the aspects of the composition - color, form, movement, etc. - are integrally related. Depending on how you build a composition you can achieve very different results. A major concept I kept in mind throughout this process was "hiding" elements within compositions. What are the different ways to camouflage elements? 100% cotton paper- Strathmore, Arches, Stonehenge- varying weights(90lb/250gsm, 140lb/300gsm), 22x30 inches cut into 2-4 pieces. Click to enlarge photos and play videos. 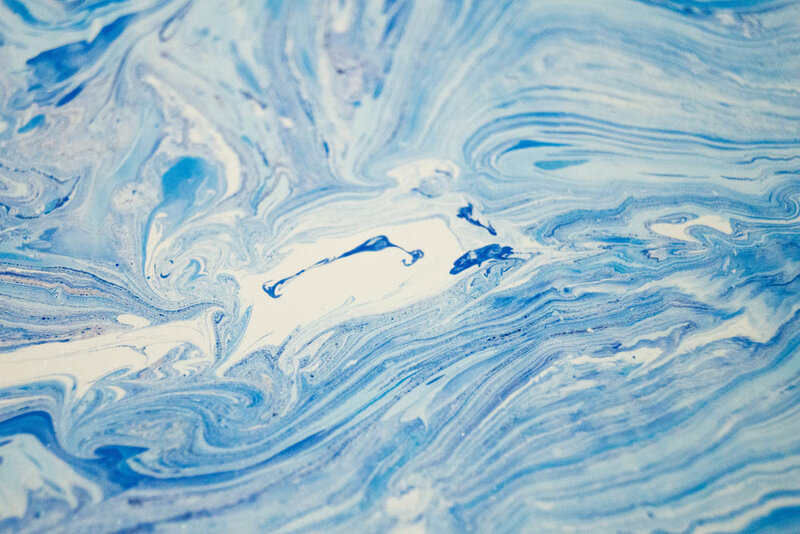 When I first started marbling, I looked at a number of project tutorials, but settled on one for the sake of clarity. This one called for methylcellulose as the size, watered-down acrylics as the pigment, and heavy weight, cotton-rag paper as the substrate. The methylcellulose was to be kept refrigerated after mixing and setting in order to prevent molding. The results I did get were fairly vague for a number of technical reasons, in addition to strategic. Even though I watched a number of videos of artists marbling a range of designs, I still didn't seem to have a sense of how the colors were going to spread or interact, how the colors were going to move, how the order in which I did things in would affect the results. When I first tried to create a figural image, the paint would expand too much and the image seemed impossible to shape. Gradually I began to get a feel for placing the paint and had some luck with forms. The acrylic paint would be more bonded to the size than the paper, so if I rinsed off the extra methylcellulose, nearly all of the color would come off with it. If I left the excess size to dry, it would result in large puddles, which were mucky, warped the paper, and completely obscured the designs underneath. The colors did not spread evenly over the methylcellulose and would form dense patterns in some areas and pale ones in others. The paper, being very stiff, would push the fluid underneath it, creating distortions in the design or trapping air, which left bare spots. The first batch of designs this round were an absolute wreck. Tigers, birds, and even simple herbal motifs were unintelligible. In the second, I managed to get some forms (polar bears), but they were largely washed out and the size was too cold and thick. In order to make the most of my flopped prints, I decided to try mimicking the effect of ebru with gouache paint, by applying it to the marbled paper .This helped me play with composition and get a sense for drawing shapes out of formless painting. I actually really like the effect of it, even though I didn't use these in any finished product. I think the contrast of the ethereal and unclear paper with the soft but brightly defined gouache has a really alluring effect, as though the figures are literally arising from the swirls. 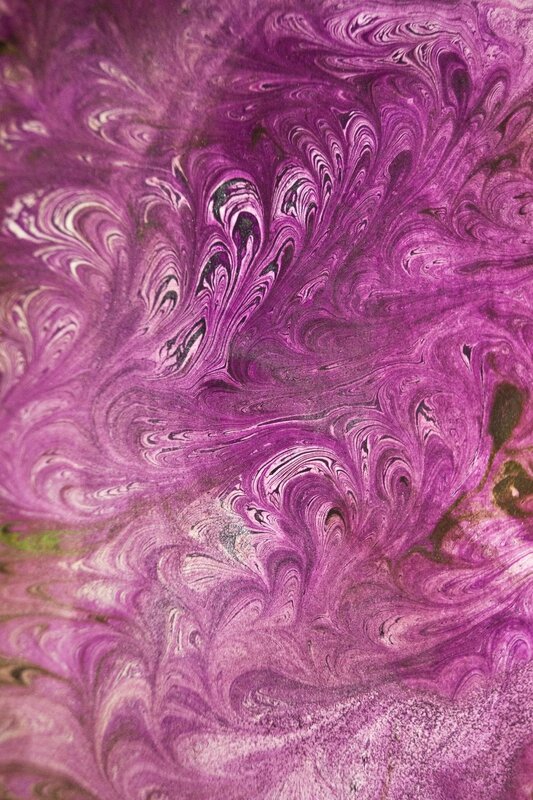 Upon further research, I discovered that carageenan is used more often as an affordable marbling size-- the result was smoother movements and less mixing of the paint and gel. I began treating the paper with Alum, a mordant, to bond the pigment and the paper better. I simply had an even better understanding of the way the paint and fluid respond to manipulation, and a sort of "order of operations". I stopped keeping the size in the refrigerator, as being too cool caused the water to move along the surface in crystalline ways. Instead I made the size the morning of. Achieving even coating of mordant. Achieving right amount of mordant (too much causes and "cracking" of pigment, too little doesn't work). Laying down paper without distortions or bubbles. 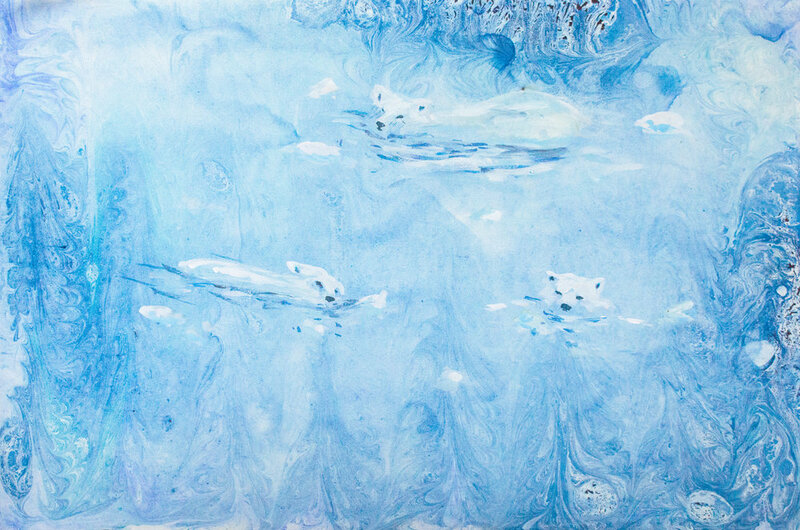 Above: The three bears print was used in two different scarf designs, a long and a square one (see Ice Caps Collection). Above: Blue spot design was digitally manipulated to create a larger, concentric design. This was used in the Ice Caps Collection. While I still was having trouble with alum and air bubbles, one of the trickiest parts of this round was color. Where do I draw the line between realism and abstraction? How do I make something sad and terrible beautiful? 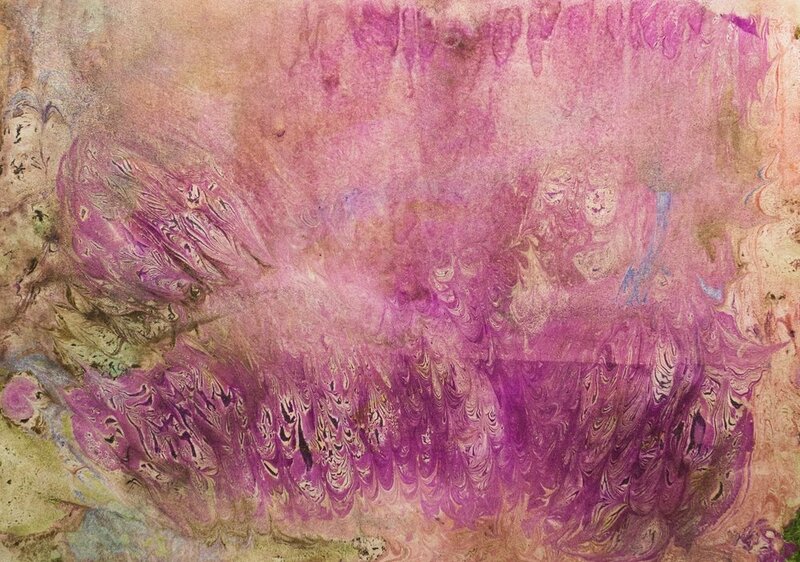 Above: Too much alum causes the acrylic pigments to pull and fracture on the paper. Above: Unevenness while laying out the paper leads to bubbles or density lines (dark strips, faded sections). Top left birds and top right spillage design were both turned into repeat patterns and used in scarf designs. See Petrol Collection. In this round I was largely inspired by textile traditions shared and evolved via the Silk Road. There was animal trade between continents for circuses and nobility, pelts and objects made with animal parts were sold, and textiles depicting exotic animals were carried west, designed specifically to maximize sales in Europe. At present, what were parts of the Silk Road are battle grounds for for oil. My focus was roundels featuring lions, tigers in the grasses, and a different design approach to birds. I produced a particularly large number of prints this day, working for at least 8 hours, and I actually had to make a second batch of carageenan. Luckily, I had coated extra paper the day before! Above: Trying to create designs within what is supposed to be a circle or other geometry is very difficult. The smallest movements elsewhere, or unevenness while applying pigment distort and shift the surface, "ruining" the shape. Above: A successful tiger illustration. It was digitally cleaned and used as a part of the Panthera Collection. Above left: A design that became "too far gone" in the process to recover. The areas of paint became too small and lost. There was no way to recover the boldness nor the desired form from the composition. Above right: Detail of the successful tiger, used in my Panthera Collection. Bottom left: Long density gap runs through design. The halves were shifted in photoshop to close the white space. 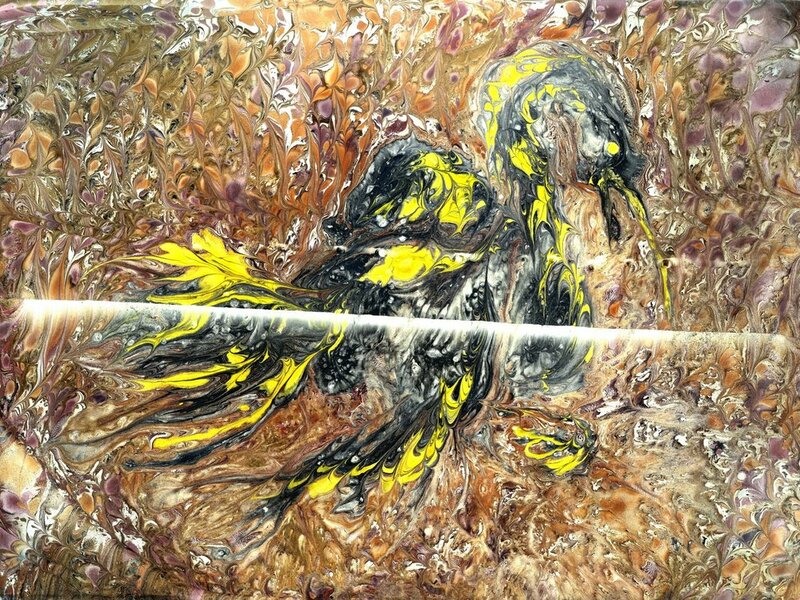 This bird was also digitally cleaned and recolored to become a more abstracted representation of oil (see Petrol Collection). By this time I was home in Massachusetts on winter break. Still set on having 3 proper collections, a bit more relaxed from being on school break, and a bit more confident and comfortable with the process, I decided to do some more marbling. The level of detail I could achieve was continuing to increase. Additionally, I acquired a new tray (a plastic bin) and had much more work space. Something notable was that the indoor environment was drier and colder compared to Savannah, where it was essentially always damp. As a result the carageenan congealed a lot on the surface. It was not as responsive to manipulation and I had to use many small, repetitive strokes to shift it. This led to a very different overall appearance. The paint did not spread on the surface in the same way and instead seemed to sit on it more like the way paint sits on paper. Even when I laid down paper at least half of the paints remained on the surface of the size, it had built up so thickly. When I tried to wet the surface with a spray bottle, the paint spread over the surface but the colors still did not move well. Too much water and I had no control over the colors. 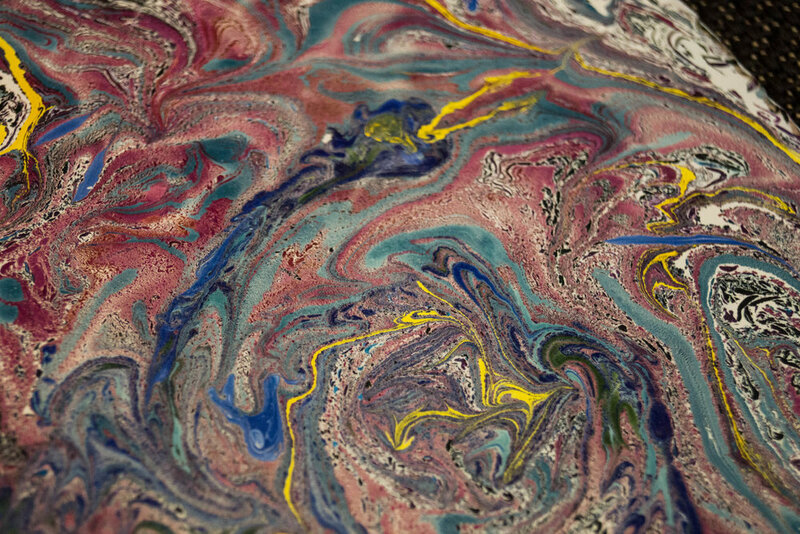 In one case the paint spread so much I had to stop marbling and start again the next day with fresh carageenan. I no longer let carageenan sit over night or for any extended period of time. Top left: The first marbling I did in the different climate, I had not been able to adapt my strategy and had a hard time correcting and controlling the forms. The effect of sprayed water is most noticeable in the black paint. Top right: The second try, this was a much more successful composition, and the way the colors sat/diffused on the surface almost reminded me of the ghostly gouache examples from earlier. This piece took over two hours to make. Bottom right: After the second tiger, I decided to try creating a leopard. The size was very thick so I laid down a good amount of water and tried to let it absorb. An utter failure, the paint was hopeless and spread in the water, unable to be adjusted and manipulated. 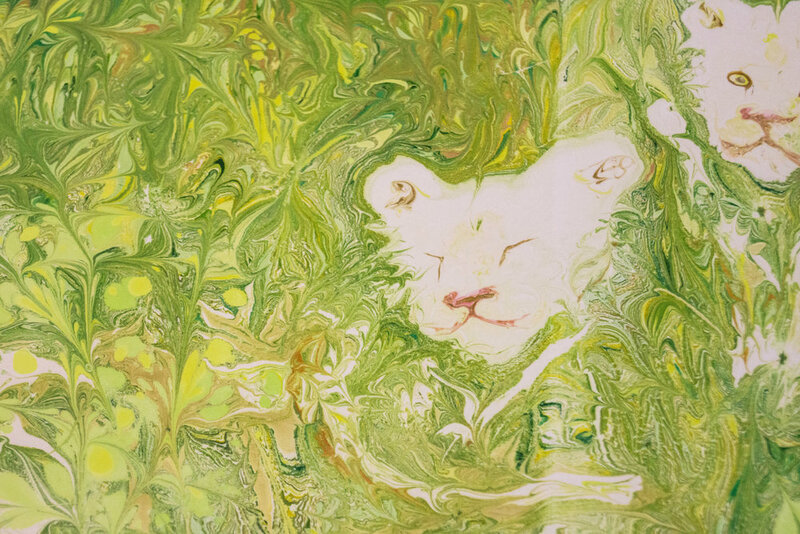 Bottom right: I had a lot of fun with the expressions of each lion, but in order to maintain the aesthetic of the collection, I decided to marble a single male lion's head looking out from the grass. This image was digitally cleaned and used in the Panthera Collection. Above: With this bird print, I wanted to try a third time, using all that I had learned in color, technique, and even preparing and laying the paper. This bird, while interesting, is a little too well hidden and strays too much from the other Petrol designs. I would love to try to translate something like this into a wallpaper though, or onto velvet cushions. Above: These hunter silhouettes were designed with the idea of repeating the motif in a concentric way, similar to the Ice Caps scarf 'Thaw'. I decided against using human figures however, as I thought it would distract from the power of the animals, potentially carrying extra controversy. Above: This Leopard was the last marble print I made. Some uneven pressure distorted the right half of the face and created ripples in the right corner, but I was pleased with the composition and detail I managed. This Leopard was digitally cleaned and used as a part of the Panthera Collection. 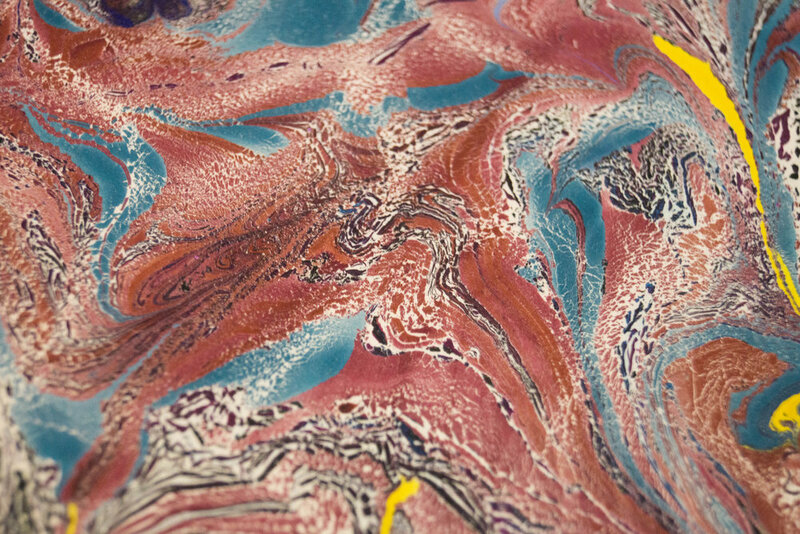 Above: Some process shots of paint sitting on the carageenan.